Recent advances in oncological research have led to a major improvement of mortality amongst cancer patients. However, survivors are at an increased risk to develop cancer therapeutics–related cardiac dysfunction (CTRCD). The management of CTRCD may pose a challenge due to its heterogeneous clinical presentation. This warrants the need for a multi-modality diagnostic tool to objectively acquire prognostic information for timely commencement of cardio-protective treatment. 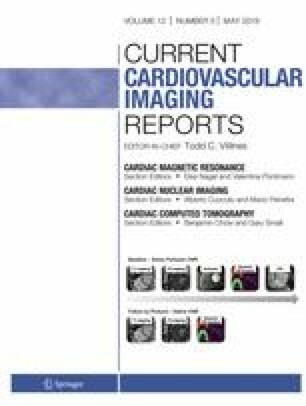 Cardiac magnetic resonance (CMR) imaging offers considerable potential due to its non-invasive, reproducible protocol. Moreover, biomarkers such as T1 and T2 mapping allow discrimination between oedematous and fibrotic myocardium, providing an invaluable diagnostic algorithm to track the temporal evolution of CTRCD. In this review, we appraise current evidence for the role of CMR in the management of CTRCD, placing emphasis on ventricular function, strain, late gadolinium enhancement and parametric mapping. We recommend a central role for CMR in the interdisciplinary management of CTRCD. Jasmin D. Haslbauer, Gesine Bug, Eike Nagel and Valentina O. Puntmann declare that they have no conflict of interest. Sarah Lindner receives travel support from Celgene, Sanofi and Neovii.